In this post, Laura introduces us to a completely genius storage idea – a cake stand that displays not cupcakes, but gorgeous fragrance. Alternatively, fill the stand with some decadent makeup palettes and other bits too pretty to keep in a drawer (Guerlain L’Ecrin 6 Couleurs eyeshadow springs to mind!). The new Guerlain L’Eau scents get the expert Candy Perfume Boy treatment in this comprehensive post. Each well balanced and evocative review is full of references and up-to-date product information so that you really get a feel for what the fragrances are all about. In this post, Charlie creates an entire look using just the new Dior Garden Party Spring 2012 Collection. From the beautiful Waterlily Vernis nail colour to the Rosy Glow Blush, the flattering pastel shades create a really fresh and flattering look. 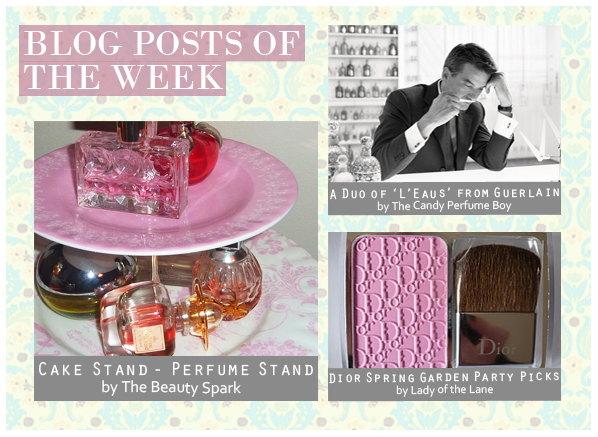 This entry was posted on Friday, February 3rd, 2012 at 8:00 am and is filed under Blog Posts of the Week. You can follow any responses to this entry through the RSS 2.0 feed. You can skip to the end and leave a response. Pinging is currently not allowed.